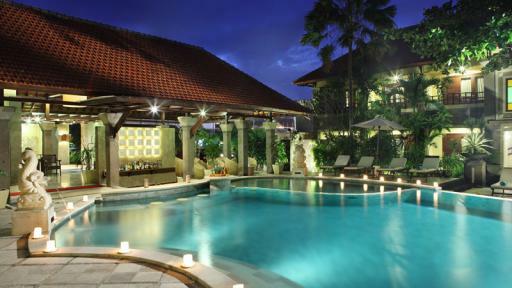 Just 5 minutes from Bali's International Airport, Adhi Jaya Hotel is set at the heart of the shopping district in Kuta. 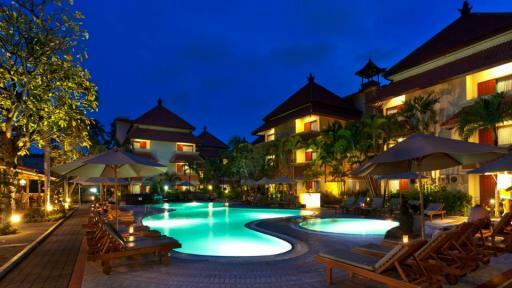 Just a short stroll to the famous Kuta Beach, the resort offers comfortable and spacious accommodation and a great range of facilities including a swimming pool, bar and restaurant and a relaxing day spa. 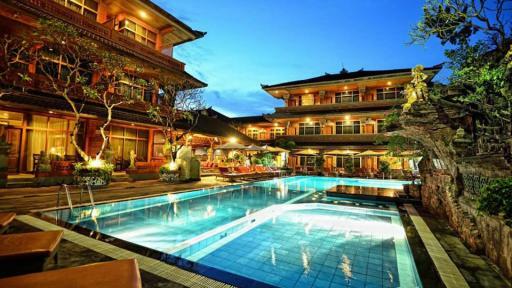 Its ideal location makes the hotel a popular accommodation choice for Bali holiday-makers. 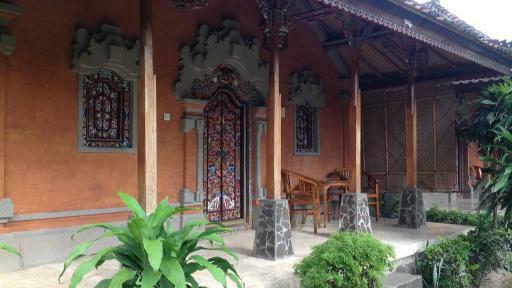 Adi Dharma Cottages offers a garden paradise just minutes from NgurahRai International Airport, the nightlife, shopping and entertainment areas of Kuta and Legian. From here you are also a short drive from Seminyak, Nusa Dua and Sanur. The accommodation overlooks the gardens or pool and the onsite facilities include a day spa, restaurant and bar. The resort also offers a complimentary shuttle bus to the beaches and Legian throughout the day. Nightly entertainment, shops, restaurants and galleries are all within easy walking distance of Adi Dharma Hotel. 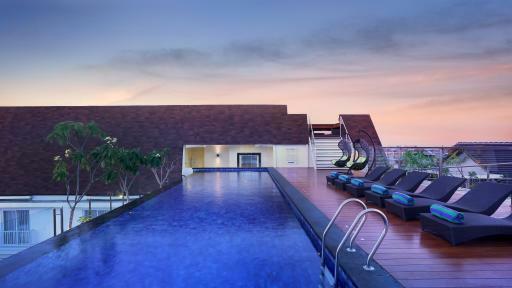 Set in the centre of Kuta, the resort is a short drive from the International Airport at Denpasar and offers private rooms with their own balconies that look out over the gardens or pool. With an outdoor pool, meditation hall, restaurant and bar, sundeck and regular cultural performances this Bali accommodation has everything you need. Surrounded by all of your Bali holiday needs, Alaya Deduan Kuta is within walking distance of entertainment, shopping and dining with the airport and famous Kuta Beach only minutes away. Each villa accommodation is set in a private garden compound with their own private swimming pool, outdoor area and gourmet kitchen. There is also an onsite restaurant, day spa and library as well as butler service and tour desk. Located in the heart of Kuta just minutes from the shopping and dining hubs of Kuta, Legian and Seminyak, Bali Kuta Resort offers deluxe accommodation set around a tranquil pool with easy access to an excellent range of onsite facilities and nearby tourist attractions. Popular with fun-loving holiday makers, Bounty Hotel enjoys a fantastic location in the centre of Kuta offering a party fun atmosphere. With all the shopping and dining your heart could desire on Legian Street and just metres to Kuta Beach, the resort features a 24 hour pool bar, all night parties and nightly entertainment and music. This affordable Bali accommodation boasts a popular location just 200 metres from Kuta Beach and within walking distance to markets, shops, bustling nightlife, restaurants and more. Coast Boast Apartments features studio and apartment style rooms with kitchenette facilities and modern amenities, perfect for couples and small families to enjoy some of the comforts of home while enjoying the Balinese culture. Guests have access to the free WiFi Internet, swimming pool, laundry service while staying at Coast Boutique Apartments. An affordable hotel featuring boutique accommodation, Dewi Sri Hotel is great value and offers a vibrant atmosphere making it popular with the young and young at heart. 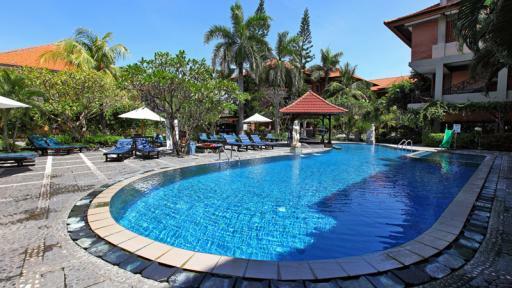 Just off JalanLegian, the hotel is located at the epicentre of Kuta's shopping, dining and entertainment district and features comfortable rooms, an outdoor pool and 24 hour poolside bar and restaurant. 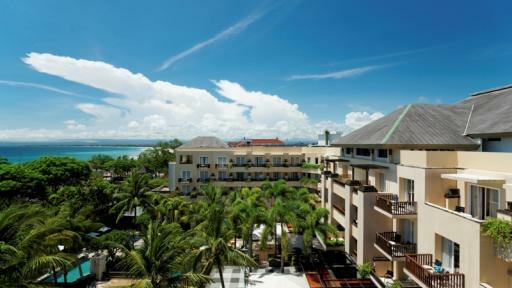 Four Points by Sheraton Bali, Kuta is less than 5 minutes walk from the popular Kuta Beach plus a number of local attractions, restaurants and nightlife are just moments away. 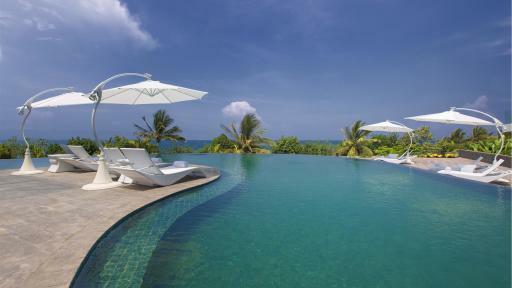 This five star Bali accommodation is home to 185 rooms and suites catering for couples and families. Relax and unwind by one of the swimming pools, head to the 24 hour fitness centre, stay in touch with the free WiFi Internet access plus children can enjoy the activity filled Kids Club. 300 metres from some of the best surf beaches in Bali, Grand Barong Resort is conveniently located close to the shopping and nightlife district of Kuta. Right in the middle of the entertainment, the resort is popular with the young and the young at heart! Accommodation is modern and comfortable with excellent onsite facilities including massage services, a 24 hour restaurant, pool bar, swimming pool and much more. 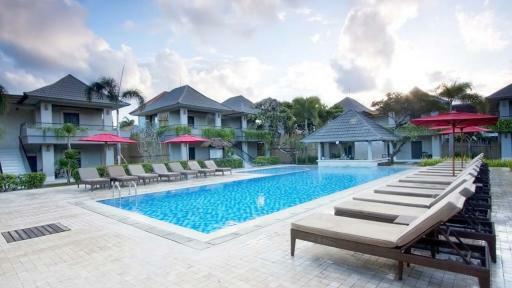 Grand Inna Kuta is located on one of Bali's natural playgrounds, Kuta Beach. Aside from the stunning sunsets and great surfing, Kuta Beach offers travellers a full immersion into Bali culture with loads of market shops, restaurants and street cafes, art markets and more. 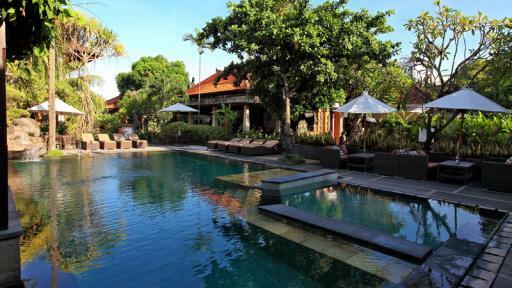 Do as much or as little as you prefer from the comfort of this great value Bali hotel. Set opposite the famous Kuta Beach, Grand Istana Rama Hotel is just metres from Kuta's shopping, dining and nightlife strip. Featuring comfortable and well-appointed rooms and suites, the resort also ha a fantastic range of facilities including an expansive pool, restaurant, and pool bar. 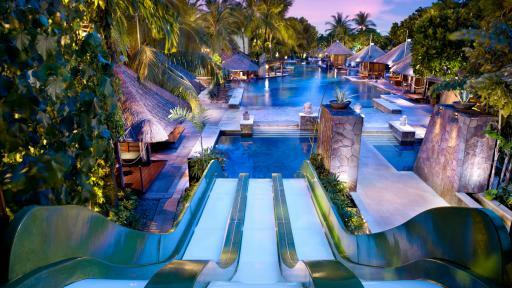 One of Kuta's most popular resorts, Hard Rock Hotel Bali offers a vibrant atmosphere in the centre of Bali. With Kuta Beach nearby, the shopping and entertainment district are just a short stroll away, the resort is renowned for its amazing facilities including Bali's biggest free-form swimming pool, a kids club, day spa, health centre, restaurants, sunken bar and main stage offering nightly entertainment. 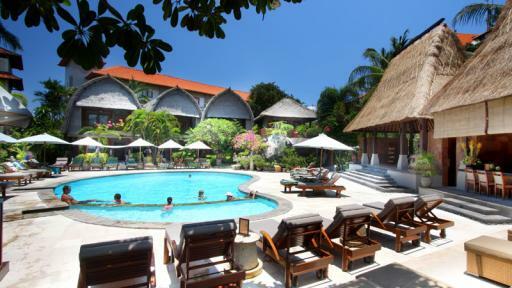 This affordable Bali accommodation is set in Kuta, offering 168 affordable rooms to choose from. Holiday Inn Express Bali Raya Kuta is only a short drive from the Ngurah Rai Bali International Airport plus shopping, nightlife, entertainment, restaurants and bars are only a 3 minute drive away in Legian. Guests have access to a swimming pool, free WiFi Internet, laundry facilities and a breakfast restaurant. 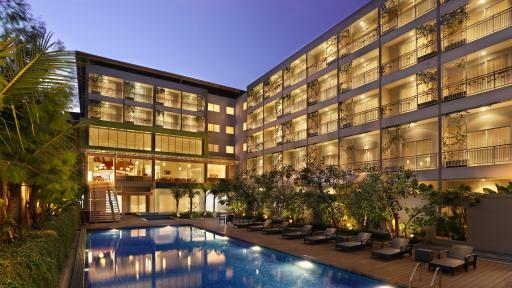 Holiday Inn Express Bali Raya Kuta is perfect for the budget conscious traveller. 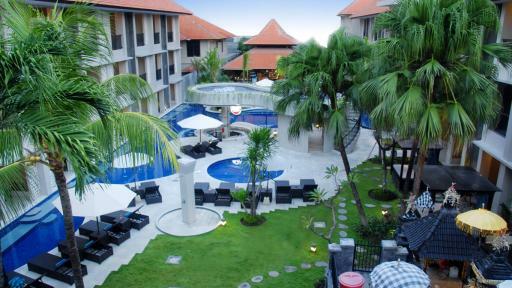 Just 15 minutes from the airport, Ida Hotel is nestled beside Matahari Department Store in Kuta's famous mall. 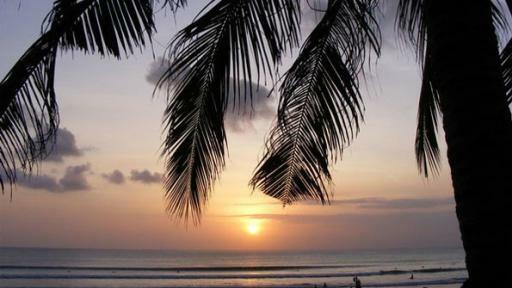 Offering cosy, affordable Bali accommodation the resort is just minutes from the beach and Legian shops. The comfortable rooms are excellent value for money and facilities feature everything from a swimming pool to a Jacuzzi, massage facilities and restaurant. Ideally located to explore all of Bali, Kuta Paradiso Hotel is close to Legian, Nusa Dua and Sanur with the International Airport just 10 minutes away. 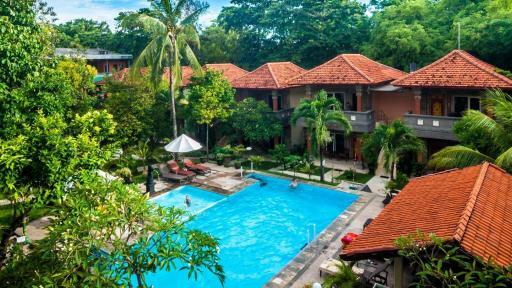 Surrounded by exotic gardens, the resort is in the centre of Kuta with easy access to dining and entertainment areas, Kuta's famous nightlife and the amusement centre. Onsite facilities include a lap pool, free-form swimming pool, terrace bar, restaurants, business centre and much more. 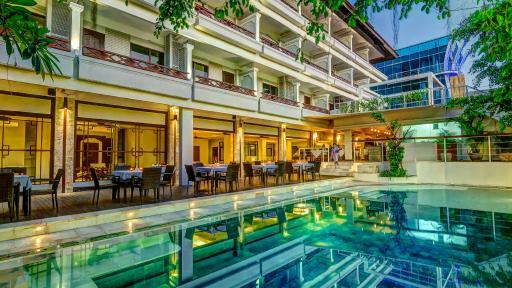 Located across the road from world famous Kuta Beach, Maharani Beach Hotel offers Superior, Deluxe Pool and Deluxe Ocean hotel rooms, an on-site restaurant & bar, spa, swimming pool and WiFi internet access. With an assortment of shopping, entertainment and restaurants all within walking distance, Maharani Beach Hotel offers value for money in a prime location. 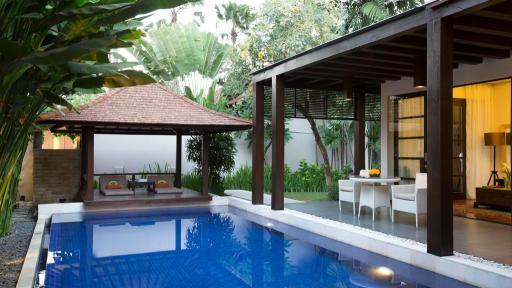 Shaded by tropical foliage, Melasti Beach Bungalows & Spa enjoy an enviable location right on Kuta Beach. 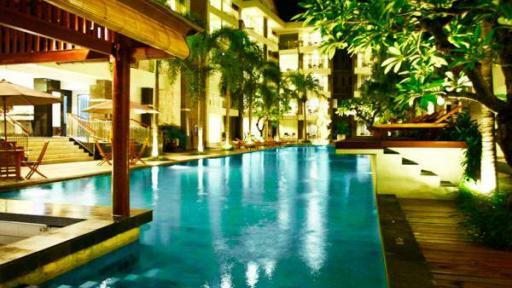 The resorts ideal location means it's close to Kuta Mall, the vibrant nightlife and the famous Waterbom Park. Just 5 minutes from the airport, the resort facilities include swimming pools, day spa, 24 hour room service and a laundry service as well as accommodation with luxurious private bathrooms of marble complete with tub, shower and balcony with views. 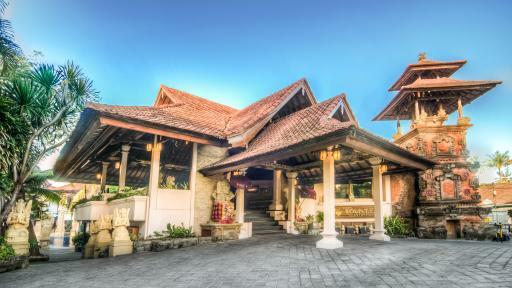 Just a couple of minutes from Kuta Beach, Ramayana Resort & Spa is a deluxe hotel designed with a traditional Balinese style. Set in Kuta's shopping, dining and entertainment hub, the resort sits opposite the Matahari store and the Kuta Art and Craft Markets, the Tuban Centre and Waterbom Park are just moments away. Facilities at Ramayana Resort & Spa include Rama Spa, swimming pools, restaurants and bars, boutique stores and a great range of activities. This Bali accommodation offers an amazing location just steps from Kuta Beach and directly adjacent to the Beachwalk shopping complex. 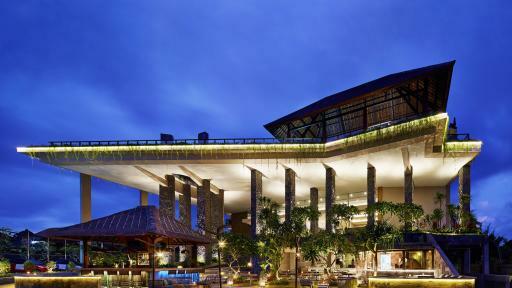 Sheraton Bali Kuta Resort features a wide range of facilities including an infinity swimming pool that is surrounded by sun loungers and umbrellas, a kids pool, restaurants and bar, 24 hour fitness centre, day spa plus complimentary WiFi internet. 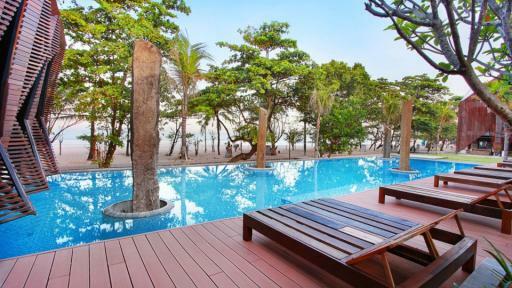 A wide range of rooms and suites are available with either tropical garden or ocean views. Nestled on 1.6 hectares of some of Bali's most beautiful gardens, White Rose Kuta Resort Villas & Spa is surrounded by ancient ornate temples lending to the atmosphere of the comfortable yet quality accommodation. Located just off Kuta's main street, the resort is just metres from a range of restaurants, shops and entertainment options as well as Kuta's famous beach. From your well-appointed accommodation at Wina Holiday Villa, stroll to Kuta Beach and check Legian Street's hub of food, shopping and entertainment. Suites surrounded by tropical gardens are perfectly complemented by an excellent range of facilities including a day spa with indulgent massage services, the expansive outdoor pool complete with pool bar, a 24 hour restaurant and a shuttle service to the local shops and sights. 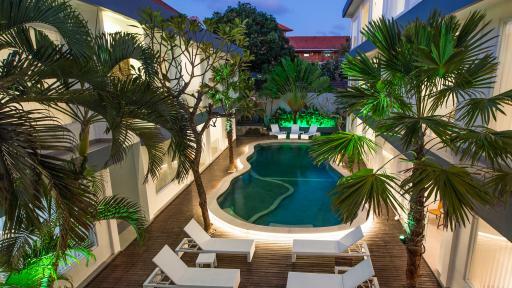 ZIA Hotel Kuta offers a desirable location just a short distance from the International Airport and a mere 300 metres from the popular Kuta Beach. A number of shops, restaurants, bars and entertainment are a short walk away from this affordable Bali accommodation including Kuta Square and Discovery Mall. The 115 modern rooms at ZIA Hotel Kuta are perfect for guests that are on the go or would like to be in a central location.